We spent a good part of this past weekend watching thoughtful and moving films at Belleville Downtown Docfest. When I first saw the line-up for this year I wondered if there would be enough films I'd like to see. In the end I wished that I could have seen more, but in several instances there were two or three excellent docs showing at different venues simultaneously. I was pleased that my former congregation, Bridge St. UC became a venue this year, allowing more films to be screened. I encouraged them to consider us through my tenure and began the site negotiation just before I retired last year. I appreciated all nine films I saw, including two set in First Nations communities. Our People Will be Healed is centred around the community of Norway House in Northern Manitoba. It spent a lot of time considering the challenges of providing good education to First Nations kids in a school which is underfunded and relatively isolated. There are also worthwhile efforts to teach children Cree even though it is no longer spoken in many homes. This goal of upholding culture and language also involves getting young people back on the land and onto the waterways through canoe trips, teaching them traditional ways. The dedication of all these educators and the receptivity of the children is inspirational. On Sunday we saw Bee Nation, which was a delight, and also very touching. 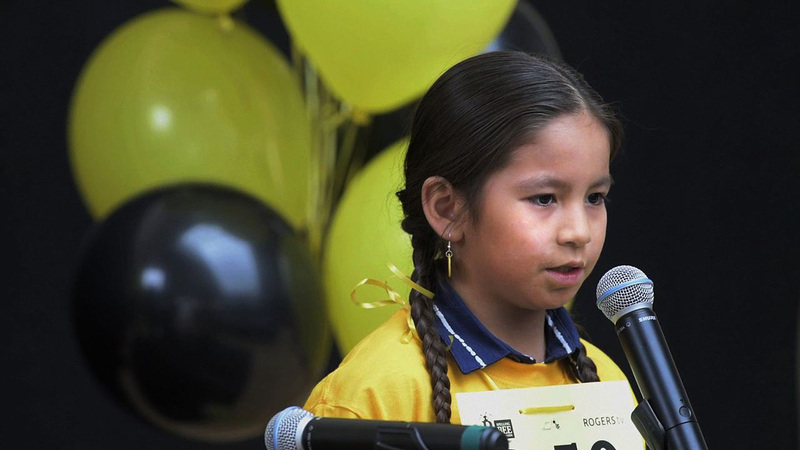 Brash young William (above) is one of four marvelous children who are featured in this film about First Nations spelling bees and the three of them who are able to travel to Toronto for the national event. They are determined young people with loving, supportive parents and grandparents and teachers. Their communities are nurturing and encouraging. Both of these films challenge the evil stereotypes of First Nations communities. One mom notes that her father was a Residential School survivor who was too wounded to be a supportive parent and she is determined to break the cycle. All the parents and grandparents have aspirations for their children which will lift them above the limitations they experienced. As we watched these documentaries I was mindful of the new funding in the recent federal budget for Aboriginal education and care. Both have been woefully underfunded, leading to a miserable cycle of broken lives. We sat next to a judge during Bee Nation who admitted she cried as she watched. She is very aware of the disproportionate numbers of First Nations youth in our judicial system. She hopes for more, as we all should. I would encourage you to find both these films and watch them. I am grateful that I have seen them as a Christian in a denomination which has been both part of the problem and is humbly seeking new partnerships with the Aboriginal peoples of this land.